Be careful where you park your car or it will end up at the scrap yard. Or at least check that weather forecast every once in a while. 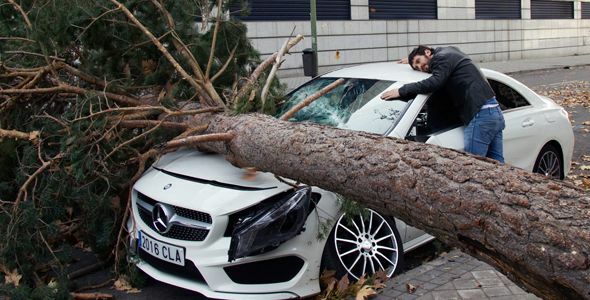 A brand new Mercedes was crushed by a tree crashing to the ground in Spain. The car is in pieces and the owner is devastated. No, no, no! Before you fall apart, read it all the way to the end! This is just the script of a new advertising video, so no real car was hurt on the set. Trying to reach a brand new range of costumers and to appeal to the young people in particular, Mercedes-Benz Spain has launched a new campaign, with the Spanish popular actor Raul Arevalo, in the lead. In the ad airing under the slogan “Follow your star”, he plays both the part of a middle aged Lord wearing a huge powdered wig and that of a young man who finds his car smashed to pieces by a tree. The spot is now aired on TV channels across Spain. It is not the first time that Mercedes is working with stars that are popular among teenagers and youngsters. Spanish film director Alex de la Iglesia and actress Maribel Verdu also advertised for the car with the star. Apparently, the campaigns have reached their target, as Mercedes-Benz is one of the leaders of the premium car market in the Iberian Peninsula. As previously mentioned, no car was harmed on the set while shooting the TV commercial. If you want to check it for yourself, watch the making of the spot below!